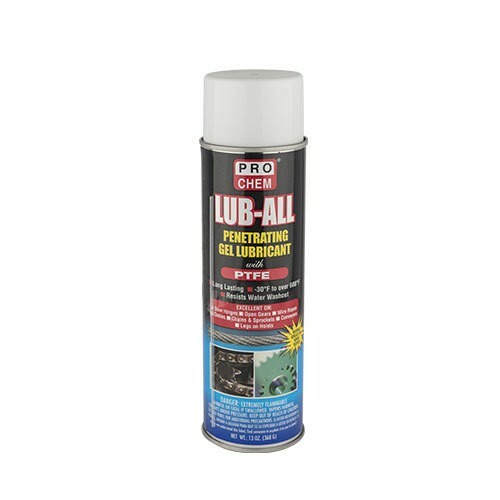 LUB-ALL | Pro Chem, Inc.
LUB-ALL is a transparent, high-pressure lubricant with high adhesive strength. It adheres to surfaces and resists throw off and squeeze out when subjected to high pressures, vibrations or repeated impact. A unique combination of natural and synthetic lubrication agents makes LUB-ALL one of the best aerosol lubricants available. Caution: Not to be used near heat, sparks or open flame. Shake well. Saturate area to be lubricated. If necessary, repeat application.